The wedding ceremony is the most important part of the wedding day. This is why the wedding is even happening and why everyone has come together to celebrate the day with the couple. 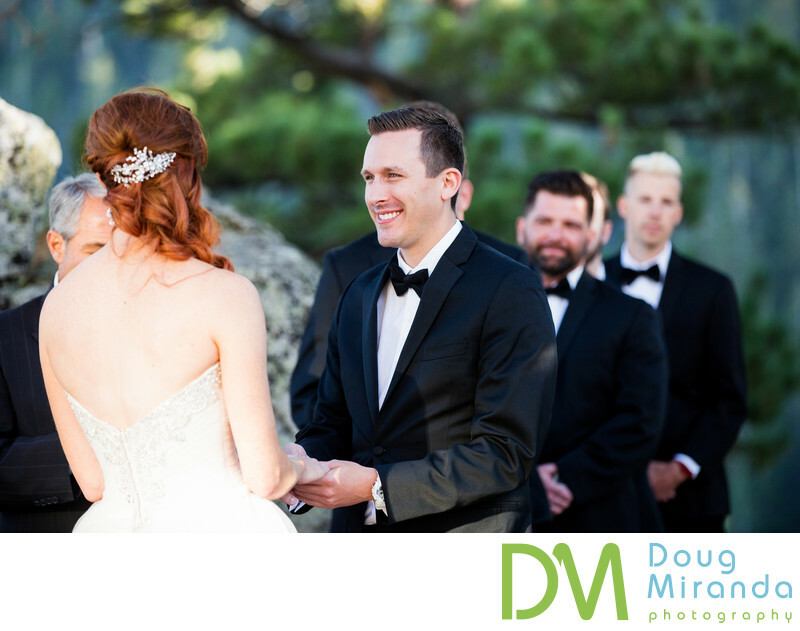 This wedding ceremony took place at the top of Kingsbury grade in South Lake Tahoe at The Ridge Tahoe Resort nestled in the pine trees high up at 7,500 feet next to Heavenly Ski resort in Nevada. The ceremony location is at the edge of a ridge next to some giant boulders over looking the Carson Valley. I love to capture true emotions on a wedding day in my photos and during the ceremony is one of the best times to take those kinda of pictures. The groom in this photo is smiling from ear to ear as he looks at his bride during their ceremony. Just looking at this photo wants to make me smile. It seems like on the wedding day the groom doesn’t get all of the glory as the bride does, so I really try and make an effort to take photographs like this of the groom. This photo really shows the happiness of the wedding day and why two people are joining their lives together. Location: The Ridge Resorts 400 Ridge Club Dr, Stateline, NV 89449. Keywords: The Ridge Resorts (21).